One of my favorite magazines is Real Simple and one of my favorite sections is where the editors show you how to use old appliances to do new things. For example, wrap rubber bands around your easter eggs before dipping in dye to make perfect patterns. Brilliant, right? Or turn the back side of an old, scratched pan into a magnet board and hang in your kitchen. A little more work, but still, pure genius. The point is, as much as a love William Sonoma and even that airplane magazine with the useless “inventions” – like a dog bowl that fills itself – it is wonderful to find the gadget you need in something you already own. So this brings us to the tale of the cucumber and the spoon. 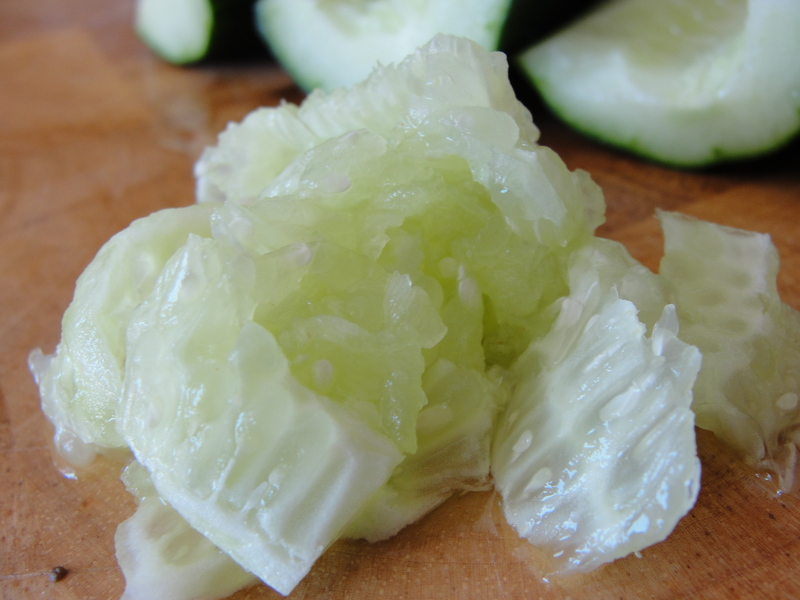 Cucumbers, served at a restaurant or cafe, always taste better to me than the sloppy mess I slice up at home. I have come to the conclusion that this is not because of my produce picking aptitude (I’m an A student), nor is it a result of my haphazard dicing. 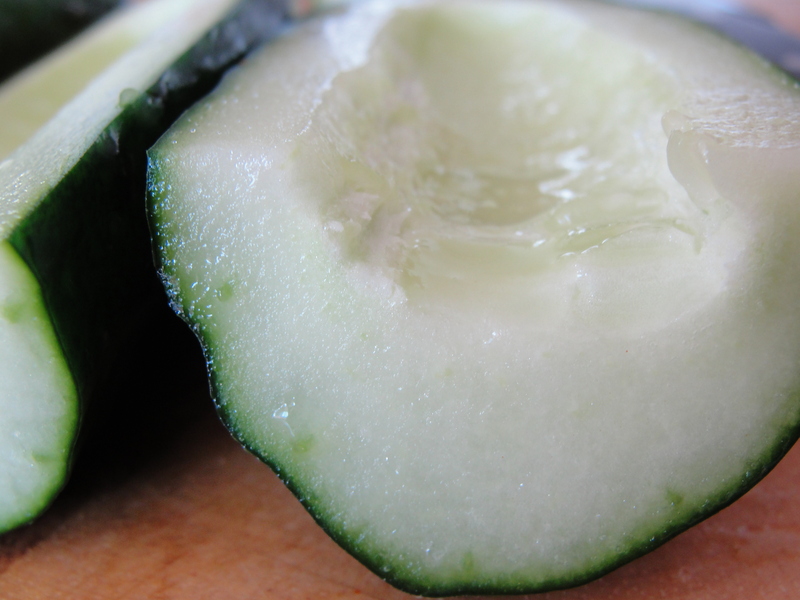 The cucumbers I tend to drool over, in cool summer salads, are pure crescents of crunch. No seeds. And trust me, I do not like to waste food. But to me, when you remove the inner mushiness of the cucumber, you elevate the taste factor by ten. Don’t rush out to find a professional, cucumber scraper just yet. Mostly because I’m actually not sure if anything like that exists. But also, because you have the tool you need sitting patiently in your flatware drawer, next to your fork and knife. That’s right. The spoon. It is so simple, it’s silly. To core the cucumber, slice in half and then run the spoon over the middle. The seeds and pulp pop out instantly and you are left with two hollow cucumber boats. From there, you can cut crescent slices and use in a salad. Or, I have filled the cucumber boats with tuna tartare and then sliced into mini bites as an appetizers. And if you really want to use the whole cucumber, top to bottom, save the pulp to make a refreshing vinaigrette for vegetables or even oysters. 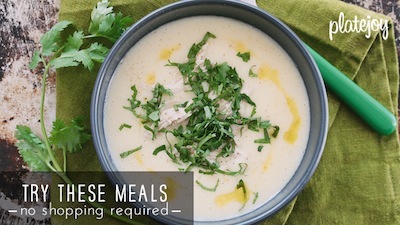 Just a simple solution to make your food taste better. You’ll never look at your spoon the same way again. Chow on. My mom´s been doing this for years. Mostly because she had trouble digesting the seeds. At first I thought it was wasting food but I started doing it as well. Welcome, Stefan! So glad to know I’m not the only one who does this. The first time I tried it, I was floored by how easy it was. I use the pulp as a facial! It feel so nice and cool on your skin and does a pretty good job of exfoliation. On another note, I thought you would enjoy reading this about sodium from a lecture at the Culinary Institute of America. 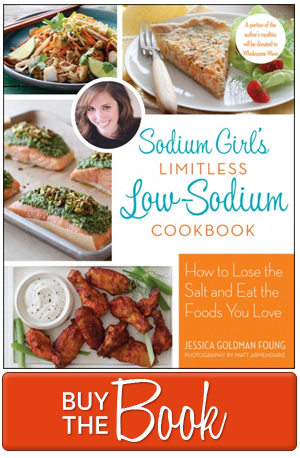 Nothing new here but I thought it was interesting that sodium content is being taken so seriously!